Here's one that's very simple. So simple that one of the main ingredient can come straight from a can. A few months ago, I tasted halloumi cheese at a barbecue and it was heavenly. It's usually made from goat milk but it does not melt when cooking, so you can grill it, cook it in a stew, and do other great things with it. In some ways, it reminds me of what you can do with tofu. 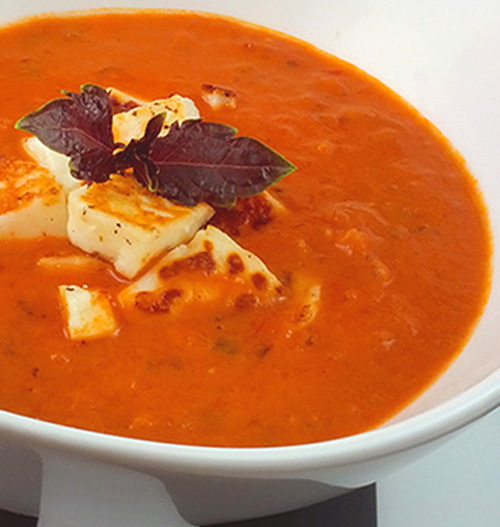 This recipe is for serving halloumi cheese with tomato soup. Heat the tomato soup. In a non-stick pan, sear and brown the outside of the halloumi cheese cubes. In a soup bowl, mix the soup and the seared cheese cubes. Serves 2. Just a quick note on the tomato soup. I typically just use Progresso soup from a can. This particular brand is hearty, creamy, and provides high fiber. But there are plenty of tomato soup recipes out there to try and I'm sure that they also make great meals.